This file includes 13 books: The Bobbsey Twins, The Bobbsey Twins at Home, The Bobbsey Twins at Meadow Brook, The Bobbsey Twins at School, The Bobbsey Twins at Snow Lodge, The Bobbsey Times at the County Fair, The Bobbsey Twins at the Seashore, The Bobbsey Twins at a Great City, The Bobbsey Twins in the Country, The Bobbsey Twins in the Great West, The Bobbsey Twins in Washington, The Bobbsey Twins in a Houseboat, and The Bobbsey Twins on Blueberry Island. According to Wikipedia: "The Bobbsey Twins are the principal characters of what was, for many years, the Stratemeyer Syndicate's longest-running series of children's novels, penned under the pseudonym Laura Lee Hope. 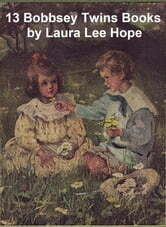 The first of 72 books was published in 1904, the last in 1979. The books related the adventures of the children of the middle-class Bobbsey family, which included two sets of mixed-gender fraternal twins: Bert and Nan, who were 12 years old, and Flossie and Freddie, who were six."